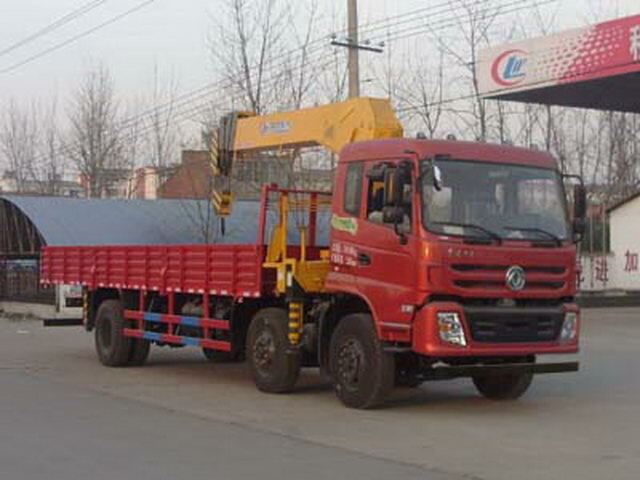 YC6J220-46 Dongfeng Cummins Engine Co., Ltd.
Crane model,Hoisting machine quality(Kg),Maximum lifting load(Kg)Corresponding relation is: (SQ10SA2,SQ10SA3)/( 3100,3800)/10000; (SQ12SA2,SQ12SA3)/(3800,4200)/12000. Crane model,curb weight(Kg),,Load quality(Kg)Corresponding relation is:SQ10SA2/12800/11905;(SQ10SA3,SQ12SA2)/13500/11205;SQ12SA3/13900/10805. 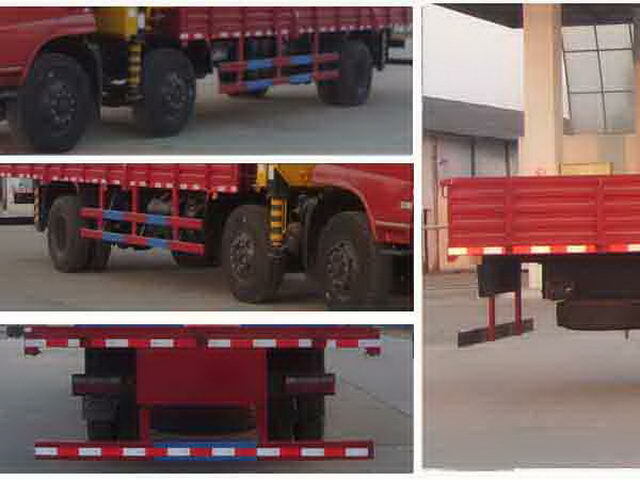 The new car chassis with optional cab,Corresponding front suspension(mm) :1250, Corresponding approach angle(DEG) :20,The corresponding rear suspension(mm) :3350. 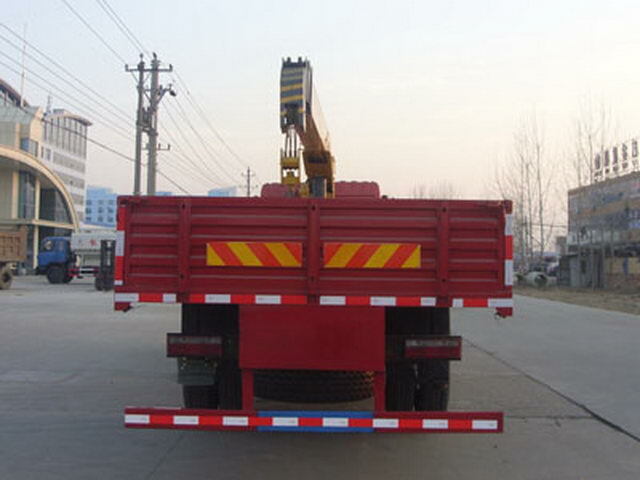 Protective material:Q235Acarbon steel,Connection mode:The left and the right sides are welded and connected with the bottom surface of the box body.,The rear lower part and the auxiliary beam are welded connection,Rear section size(mm):130*50,Rear protection height(mm):510. The car is only used in the engine fuel consumption values(L/100km)byISB190 40/37.3,YC6J220-46/37.3,ISB210 40/37.3. Vehicle traveling data recorder with satellite positioning function.ABSModel:4S/4M,Manufacturer:WABCO vehicle control system Chinese Co. ltd..
Other: The same series of optional cab,Optional location of exhaust muffler.ISDe200 40The net power is134.2kw,ISDe185 40The net power is130.2kw,ISDe210 40The net power is149.2kw,ISB190 40The net power is134kw,ISB210 40The net power is149kw,YC6J220-46The net power is153kw. Shape length(mm)Wheelbase(mm)Angle of approach/Departure angle(DEG)Front suspension/Rear overhang(mm)And servicing quality(kg)Corresponding relation is:9545,1950+4000,30(20)/21(23),1250(1450)/2345(2145),6200;10025,1950+4250,30(20)/19(21),1250(1450)/2575(2375),6200;10505,1950+4550,30(20)/18(20),1250(1450)/2755(2555),6300;10905,1950+4950,30(20)/18(20),1250(1450)/2755(2555),6300. Optional speed limiting device,Speed limit80km/h,Optional disc brake device.ABSModel:4S/4M,Manufacturer:WABCO vehicle control system Chinese Co. ltd..